Installation with Kings Custom Hardwoods is fast and easy from start to finish. Here are the basic steps to your new flooring installation. 1 – Schedule an in-home estimate and site inspection. One of our flooring specialist will come to your home and measure and inspect the space you would like to have floors installed. 2 – Meet at our new showroom to review flooring options and pricing. A visit to our showroom will open your mind to the possibilities of flooring in your home. Choose from any of the hardwood flooring options we have in stock or bring examples of flooring you like and we will do our best to find a matching floor to fit your style. 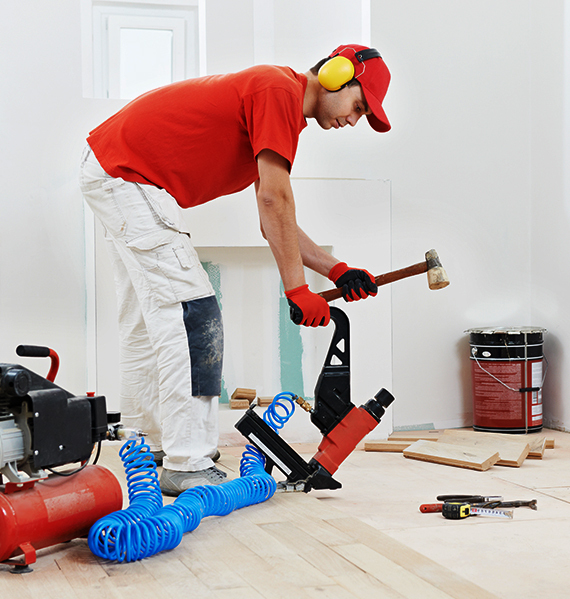 We will provide a quote for installation and materials after flooring is chosen. 3 – Decide on your installation schedule. Flooring installation schedules very so we will work on timing that best fits your schedule. Move everything out of the space that you want to have flooring installed. We work with local movers if you need help moving furniture in your home. Our experts will install your beautiful new hardwood flooring in your home in the agreed upon time frame. Inspect your project and sign off on the completed project. We aren’t done with your project until you are 100% satisfied. 7 – Enjoy your new floor for years and years! Visit our FAQs page for any other flooring questions or give us a call to schedule an appointment to discuss your flooring installation!